In a large bowl and whisk in the white rice flour, cornstarch, water, beer, scallions and turmeric, and season with a pinch of salt. Let the crêpe batter rest for at least 20 minutes or refrigerate overnight. Heat 1 1/2 tablespoon oil in a large skillet over medium-high heat. Add shrimp; saute until cooked through and opaque, 3 to 4 minutes. Season with 1 Tablespoon of char sui package. Transfer filling to a bowl and set aside. Over medium heat…add 1 1/2 teaspoon vegetables oil in a nonstick skillet (I like to use a 10in skillet) Stir the crepe batter and ladle about 1/2 cup of batter, pour batter into the hot skillet, swirling to coat the bottom. Cover for about 1 minute. Next uncover and lay 3 or 4 of the cooked shrimp and pork lion pieces on the bottom half of the crepe. Top with a small handful of bean sprouts. Cover for another 1 minute. Cook until crepe bottom looks golden and edges start to brown pulling away from the pan about another 1 minute. Fold crepe over and slide onto an oven-safe plate. Serve immediately..crepe taste best when it is hot. Serve with lettuce, cucumber, and different types of herbs (cilantro, mint, basil). 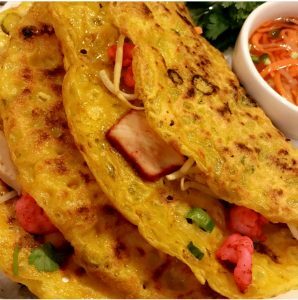 Break off pieces of crepe and roll up in lettuce leaves to eat. 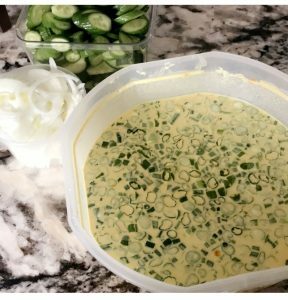 Dip with prepared fish sauce (nuoc man). 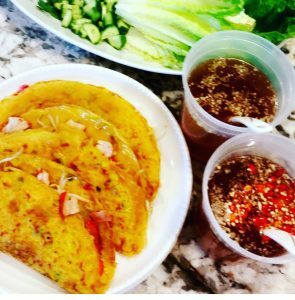 *You can also pour fish sauce over the crepe or roll it into a spring roll wrapper (banh trang). No matter how you prefer to eat it…it’s still delicious! !